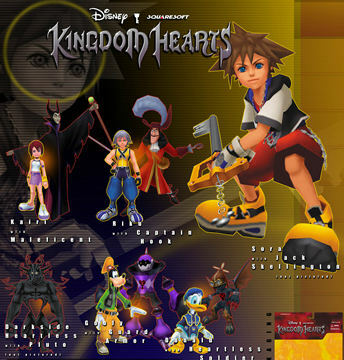 I remember around the time when KH1 came out, Gamestop's wall was just lined with these things... what a glorious time. On that first day I got Riku & Captain Hook and Donald & the Air Soldier. 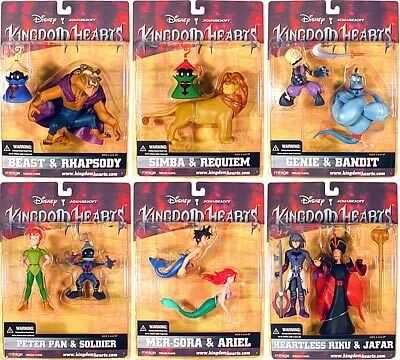 I eventually collected Darkside & Pluto, Goofy & Guard Armor, Simba & Requiem, Genie & Bandit, Peter Pan & Soldier and Heartless Riku & Jafar. Now they are just sitting in a random toy bin in my basement, which was a terrible idea because they break fairly easily, esp. wave 1. I remember these! I wasn't able to get any of them, but I remember always wanting them (I swear that these were in the instruction manual for vanilla Kingdom Hearts I, but it's been awhile since I looked into that). I remember that they were selling figurines of the main cast, Maleficent, even Cloud IIRC. I'm assuming some of these images are not finalized promos. A long time ago a friend donated his collection. Series 1 is in the blue boxes, and out of those I had the Sora + Jack Skellington, Riku + Captain Hook, and Kairi + Maleficent packs. I think I have Mer-Sora and Ariel from Series 2, which are the boxes with the red packaging. I have never heard of these before! Yes! I remember something along those lines. I remember that they were selling figurines of the main cast, Maleficent, even Cloud IIRC. I'm assuming some of these images are not finalized promos. Correct. The last three images are just concept art, which I thought was interesting because The Queen of Hearts and Mickey were initially supposed to be figures. The Heroes and Villains packs; not sure if those were going to be mini-figures or full-sized. A long time ago a friend donated his collection. Series 1 is in the blue boxes, and out of those I had the Sora + Jack Skellington, Riku + Captain Hook, and Kairi + Maleficent packs. I think I have Mer-Sora and Ariel from Series 2, which are the boxes with the red packaging. 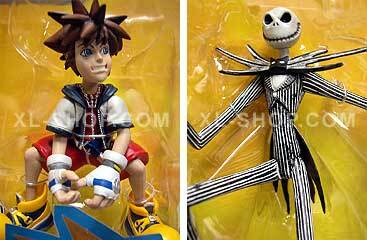 My god Sora looks creepy. He looks like a killer toy who is gonna sneak up in your bed at night, and whack you in the head with his Keyblade.